This weekend, I broke open my first can of pumpkin of the season. I slept with the windows open. I had my first pumpkin beer. But there’s still a week left of summer. So, I didn’t break out the riding boots just yet. And I ate a lot of strawberries. If there was a name for those weeks where summer is basically over, but it’s still not quite fall, it would probably be a little something like “the absolute best time of year ever ever ever.” Can we please have it be this way forever? Anyway, the rule reason I made this recipe is because a travesty was occurring in my kitchen. A serious one. Really. I opened my cabinet the other day to discover that I had a container or Nutella residing inside that was about to expire. WHO lets a container of Nutella expire?? Isn’t that breaking some sort of law or something? It might be one of those weird state laws that are never really enforced and you’re always shocked to hear about, but still (speaking of, did you know in the state of Massachusetts “No gorilla is allowed in the back seat of any car”? For real). So before I got thrown into prison for life, I decided to remedy the situation. Phew… close call. This dessert would be a great one to serve for dessert at a dinner party. Crostini, bruschetta, toasts, whatever, are all dinner party perfection because guests can grab and nibble. But you can also whip up a batch of these pretty quickly and just keep them in your fridge, so you can nibble on them when you please. Which also means I think is OK if it’s for breakfast, too. 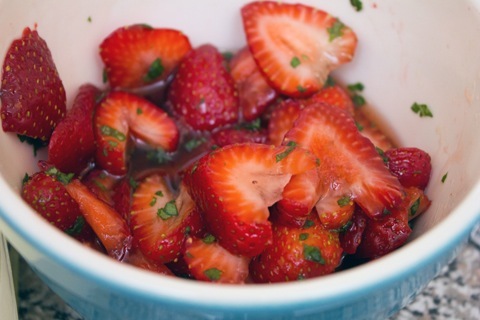 Put your sliced strawberries in a bowl with the maple syrup and basil and mix together. Let marinate together for about 30 minutes. 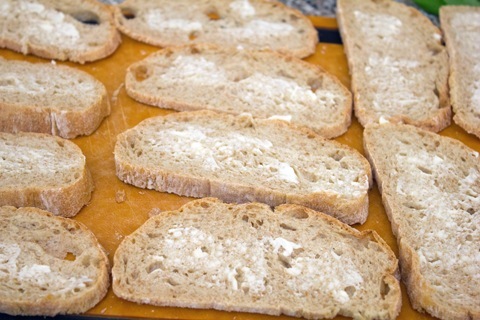 Lightly butter each of the slices of bread and pop in the toaster oven until very lightly browned. 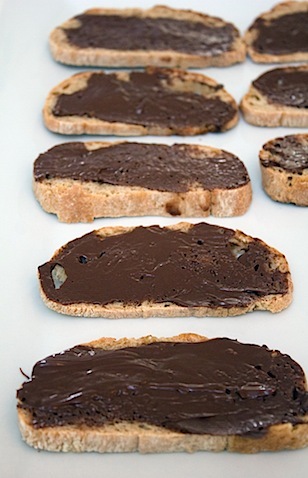 Spread a thin layer of Nutella on each slice of bread. Followed by a light layer of ricotta cheese. Did you know I used to absolutely hate ricotta cheese? It all started because I ate lasagna for 7 days in a row as a kid and I ended up getting sick. Then I shunned it for years. But I finally came back around. Especially when it comes to ricotta in desserts. 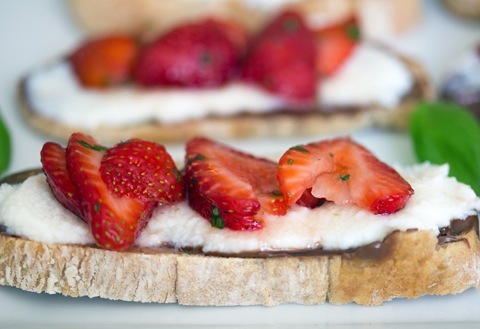 Top toasts with a few strawberries. If you’d like, you can drizzle a bit of the extra maple syrup marinade over the top, too. Let’s stop for a second and think about the fact that there’s absolutely nothing not to love about these. Each and every ingredient is glorious all on its own. 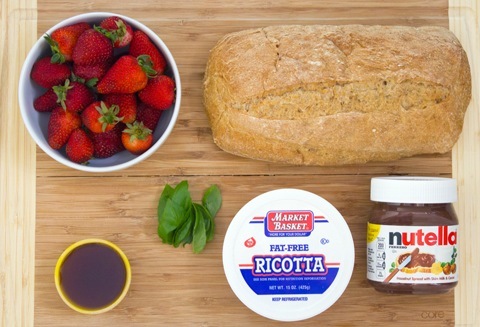 So, when you put them all together on BREAD, there’s no way you can go wrong. I guess this was something of a farewell to strawberries for a little while, too. I added the basil in because my basil plant is legitimately growing like crazy. We went out of town for 5 days and when we came back? Well, the basil plant was a little bit thirsty, but we gave it one drink of water and it was suddenly flourishing again. I want it to last all winter. But instead, I’ll probably just make pesto. And continue to add basil to desserts for as long as it lives. What I’m trying to say is that I totally get that basil is maybe not something you’d normally put into a dessert. But it works here. It really, really does. Don’t believe me? Go for it and add mint instead. I won’t be offended. 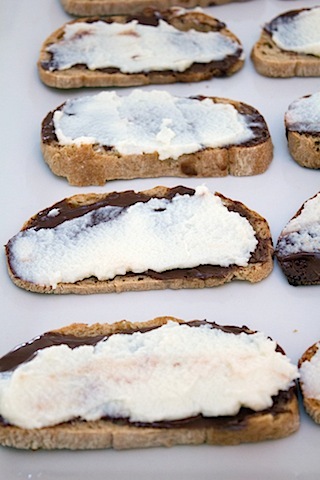 In case you were wondering, Nutella and ricotta are a match made in heaven. Two fabulous spreads meet on one piece of buttered toast and live happily ever after. And lots of little maple syrup marinated strawberries join their family. And everyone lived happily ever after. In my stomach. I really don’t think I got enough sleep this weekend. Now, if you’ll excuse me, I’m totally eating these for breakfast. Shhh. Maybe I’ll even have a pumpkin spice latte with it. I told you this was the best time of the year! Also, my Nutella jar is empty (I had to finish the remainder of it with a spoon), so I’m definitely not going to jail! Let’s celebrate. Have you ever left a jar of Nutella unfinished? 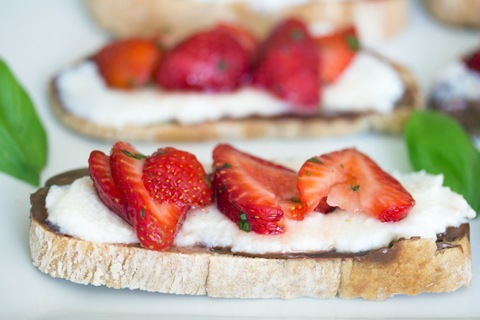 31 Responses to "Maple Strawberry Nutella Dessert Crostini"
I agree- this really is the best time of year! I’m in the in between too. Holding on to summer but loving the return of fall flavors like pumpkin! Love this unique combo for dessert! So glad you saved the Nutella, ha! Nutella never lasts long enough in my apartment! Dangerous and delicious looking, just the way I like it! 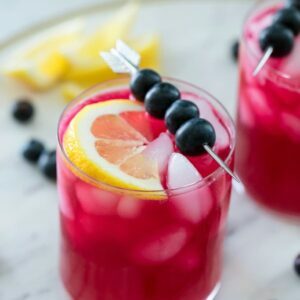 Great post, thanks for this recipe!! Expiring nutella?! YES- so glad you didn’t let that happen !! 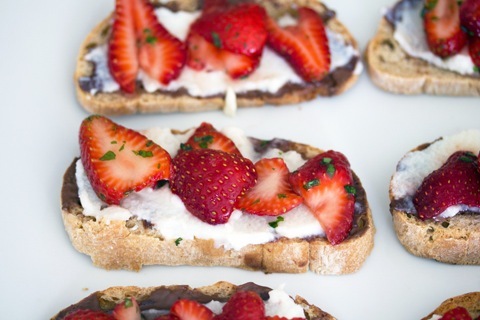 That Nutella Crostini is calling my name! Looks delicious! I’m always looking for fun nutella recipes because who doesn’t love nutella? I’m guilty of sitting on the sofa with a spoon and nutella. 🙂 It comforts me! Ha! 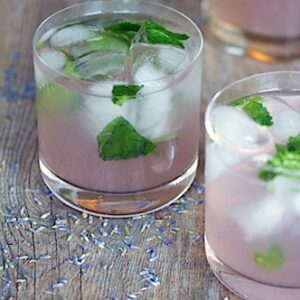 Strawberries and basil sound sooooo good together. Well and Nutella doesn’t hurt either! This looks like a perfect breakfast! Letting Nutella go to waste definitely has to be some sort of crime. Good save!! i’d eat this year round! Ah summer, we are already having the rain…it’s over for us!!! But one bite of this and I could be brought back:). Pinning for the Spring!! I would love a slice or three for breakfast right now! Great way to use the nutella. No, I don’t think we’ve let a jar even come close to expiring! That is a tasty treat for sure. You are right, they would be fun to serve at the party. YUM! 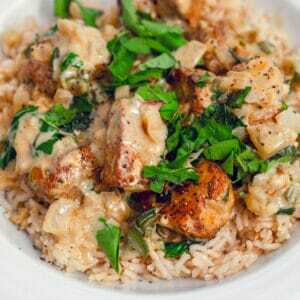 Love the flavors & textures in this one. 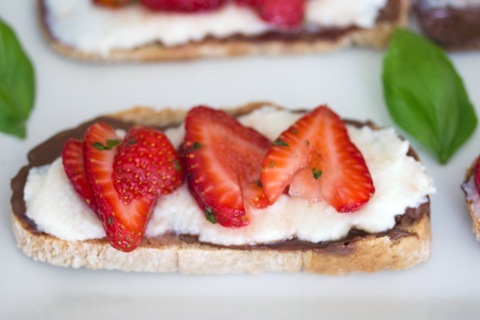 I never thought to make a desert crostini, genius! Also, thank goodness you used the Nutella or I would of have to fly over and teach you a lesson! We go through Nutella one after the other so no leftovers here. This looks delicious. A sweet crostini…looks delicious with all the layers…beautiful dessert! Truth. I found myself in a similar nutella expiration situation a few months ago. And I may or may not still be in therapy for it. 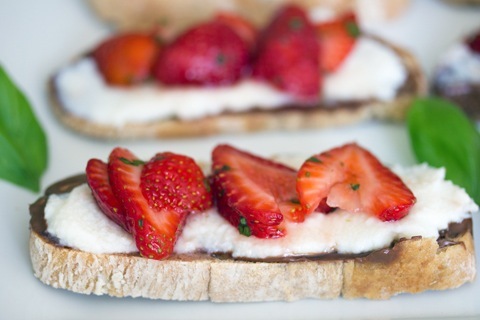 Just eat a few more of these crostini…it will all be okay! Oh wow! 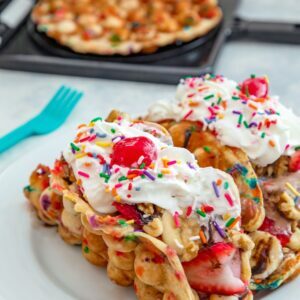 This dessert looks and sounds so so so good! 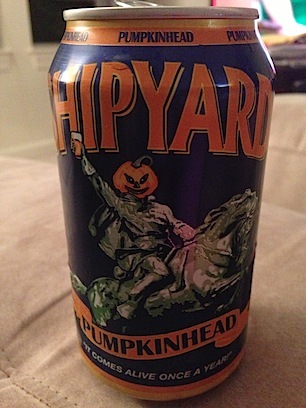 I’ve never had a pumpkin beer befroe but a friend brought one as her BYOB to my place last week. It smelled amazing and she really seemed to enjoy it. I’m going to snag one next time I’m at the store and try one too. 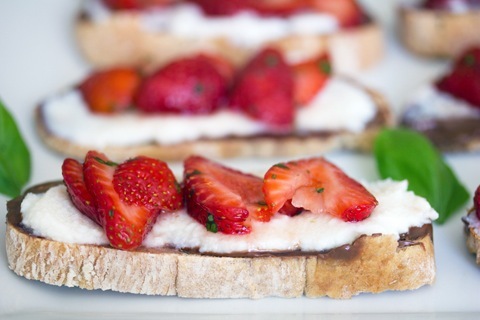 And these crostini sound delicious by the way! I love this easy and tasty appetizer! Gosh I’m lucky if the Nutella in my house gets on anything besides a spoon! I swear it never makes it to any recipe, let alone toast! I’m not ready for fall—it’s still summer here! Oooo! Nutella and Ricotta?? Swoon!